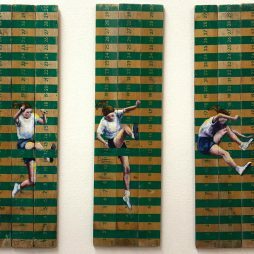 Lindsay’s work explores, through painting, objects and photographs, the theme of childhood and growing up. While photographs act as the springboard for Lindsay’s work, she does not record the past, exploring instead the complexities of childhood, together with narratives that remain relevant in adulthood. Objects associated with childhood communicate a longing to hold onto the past. The combination of chalk and paint acknowledge the ephemeral nature of youth. 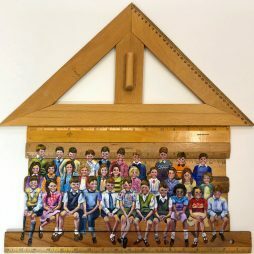 Lindsay’s latest body of work continues to focus on our experiences of school, with the notion of continual measurement (physical, mental, academic) against peers and siblings. Children’s body language is honest, universal and timeless and is the central focus of Lindsay’s work. Vintage rulers and blackboards, long associated with school provide a perfect context for the figure, allowing the viewer to probe their personal, and individual memory archives and to apply their own narratives. Lindsay graduated from Sunderland University in 2013 with a first class honours degree in Fine Art.